Stress isn’t all bad, despite everything that is often said to the contrary. The stress response developed as a survival mechanism, giving early humans a little help to survive encounters with large, hungry animals. Even in the modern world where most of us will never encounter a hungry tiger, some stress improves motivation and focus. 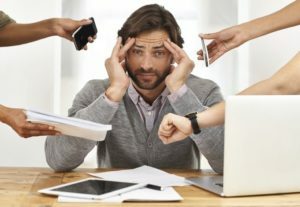 Too much stress, however, can have the opposite effect, leading to depression, anxiety, and even physical health problems. When you are in a dangerous or challenging situation, your brain sends signals to your thyroid and adrenal glands to release hormones that help you focus and improve your reaction times. Early humans developed this survival mechanism to help them escape from hungry tigers. Most of us don’t find ourselves running from hungry tigers, but we still experience the same response when dealing with debt, work stress, and other challenges. Stress hormones send the body into overdrive, which is great for life threatening situations, but can take a tremendous toll on our bodies. Combine this with inadequate nutrition and lack of restorative sleep, and we can end up depressed, anxious, and sick. Studies have shown that people who are stressed out are at increased risk of many serious illnesses, including heart disease and cancer. Good stress management can improve your health, prolong your life, and increase your quality of life. The good news is, managing stress can be a simple matter of learning a few strategies. Avoid stimulants – Caffeine, alcohol and nicotine may seem to help you deal with stress, but will actually increase it by adding to the strain on your system. Exercise – There is a reason why the stress response is called fight or flight. It is intended for situations that call for a physical response. Because of this, physical exercise can help metabolize stress hormones so you can think more clearly and be more productive. Relax – Stress can cause insomnia, but insomnia can also increase stress levels. Following a relaxing bedtime routine can stop this cycle in its tracks. Meditation – Meditation and other relaxation techniques can help you focus on yourself, relieving stress. With many techniques to choose from, experiment with several to find a technique, or combination of techniques, that works best for you. Take control – Stress is often caused by unexpected situations or those that seem to be out of our control. Sometimes, the best way to handle these situations is to find constructive solutions.If your company is laying off employees, be sure to update your resume and get in touch with your network. If you’re facing significant debt or unexpected expenses, look for ways to set aside a little extra to help cover it. Whatever it is, facing it head on can bring it down to a manageable size. Talk it out – Talking about your stress can help ease much of the tension that comes along with stress. It can also help you to process your thoughts about the situation and come up with solutions. Talking to a friend is great, but a qualified profession like the psychologists at Chiropractic and Allied Health are knowledgeable and trained to help you develop skills that can help you manage stress in the long term.